The 76ers are quite fond of this Nerlens Noel guy, enough so to give him as much time as possible to rehab that surgically repaired left knee of his. Having seen what the Sixers went through last season with Andrew Bynum, who sat out last season with a bevy of knee injuries, Noel said he wants to do everything in his power to play next season as well as win over Philly fans. On the coach search. Hinkie, no surprise, does not feel any pressure to take as much time as possible to find the Sixers’ next coach. He wouldn’t confirm reports that they’ve narrowed the field to two candidates, nor would he say who he’s interviewed. On Royce White. Hinkie said he has “no plan at this time” for the integration of Royce White into the Sixers’ system. White, a No. 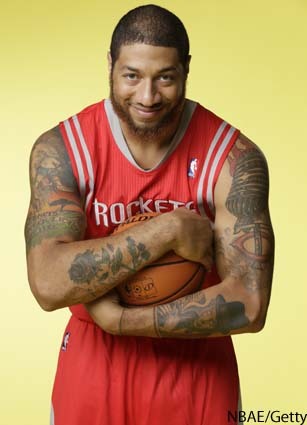 16 selection by Houston in the 2012 draft, did not play for the Rockets last season while battling anxiety issues. The Sixers acquired him this offseason. 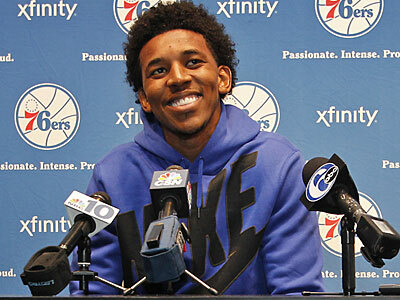 “Royce and I have talked about it a bit and it’s the kind of thing we’ll talk about more when he comes,” Hinkie said. The 76ers will introduce Nerlens Noel in a 1 p.m. press conference Tuesday, nearly a month after they traded for the Kentucky freshman. Sixers general manager Sam Hinkie and Noel will be at PCOM for the early-afternoon presser, making official – at least from the Sixers' end – the transaction made June 27 on draft night. 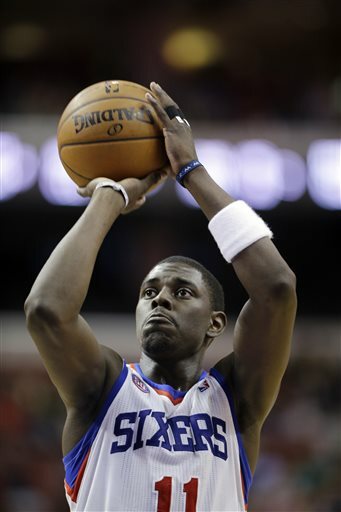 The Sixers sent Jrue Holiday and the rights to their 2013 second-round draft choice to the New Orleans Pelicans for Noel and a top-five-protected 2014 first-round draft selection. The Pelicans introduced Holiday, a 22-year-old All-Star point guard, in a press conference July 12. A number of factors contributed to the trade hold-up. Hinkie and the Sixers brass had been in Florida for the team's involvement in the Orlando Pro Summer League, all the while Holiday – who was married recently – was on his honeymoon and therefore couldn't sign trade papers. Last week, Hinkie was in Las Vegas for a summer league out that way, thus pushing any possible announcement to this week. Noel, a 19-year-old, 6-10 center, has not played competitively since tearing the ACL in his left knee Feb. 12. He's not expected to be healthy enough to debut for the Sixers until December at the earliest. Widely anticipated to be taken first overall in the 2013 NBA draft, Noel slid to No. 6 due to health concerns related to his knee surgery. The Pelicans selected him sixth overall. Noel averaged 10.5 points and 9.5 rebounds in 24 games in his only season at Kentucky, earning SEC Freshman and Defensive Player of the Year distinctions. Noel is expected to be a key contributor to the Sixers' rebuilding process that's being steered by Hinkie. The team has only one veteran (Thaddeus Young) under contract beyond the upcoming season. The Sixers would have to make a qualifying offer of $8.7 million in order to make counteroffers to Evan Turner in the offseason, while Jason Richardson -- who's recovering from new surgery -- has a player option for the 2014-15 campaign. Every other veteran on the roster has an expiring contract. Andrew Bynum, at Cavaliers introduction presser: "Yes, I'm going to be ready"
More than a few times last season, Andrew Bynum uttered the words, "I'm going to be ready." Friday, he said them again. This time, in front of a contingent of Cleveland reporters as the 7-foot center was introduced as a member of the Cavaliers. Bynum, who made $16.8 million last season despite never playing for the 76ers, got a 2-year, $24-million contract from the Cavaliers. And after twin knee surgeries, he hopes he can finally put to rest all of the criticisms that dogged him last season --- namely, that he never wished to play through pain. "I want to play a full season," Bynum said. "There is no doubt in my mind that I couldn't do that. Yes, I'm going to be ready. That is the plan. As long as I stick to it, I really believe that I have a great chance with this organization." Bynum characterized comments about his work ethic as "completely" out of line. "I worked really hard to get where I am, and I continue to work hard," Bynum said. "I've had injuries in the past, and there is a lot to be said for people who think that way. But I think if you get to know me and you look at how hard I have worked to get where I am now, that that's kind of nonsense." A number of setbacks prevented Bynum from ever making it onto the court with the Sixers, who traded for Bynum in a four-team deal last August. January of last season, he engaged in 1-on-0 workouts. February, he practiced with his team for the first time. By March, he had given up on the season and chose to undergo surgery. So returning to form, with Bynum averaging a double-double in the 2011-12 season with the Los Angeles Lakers, his most productive year as a pro, is next up for the big man. "I feel like for me getting my career back on track and really playing a full year is my only goal with this season," Bynum said. "I really feel like I can accomplish it. Work ethic-wise, I come in every day and I work hard. I don't really -- I feel like it's a little bit unfair at times, but that's just something that comes with the territory. Obviously, you take that and use it as motivation to come out and prove everybody wrong." Count Sixers fans among them. The 76ers’ draft-day trade with New Orleans for rookie center Nerlens Noel will become official today, with the Pelicans hosting a 7:30 p.m. press conference to introduce Jrue Holiday. The deal was delayed because Holiday had been on his honeymoon and could not sign the trade papers. Also, Wednesday was the first day on which trades could be announced, per NBA rules. In need of an impact post player, the Sixers made the aggressive move June 27 to swap Holiday, a 22-year-old All-Star point guard, for Noel, a 19-year-old center who’s rehabbing from surgery to repair a torn ACL. Noel, widely viewed as one of the draft’s top talents, slid to No. 6, where the Pelicans selected him. The Swag has left the building. Multiple reports Thursday confirmed that free agent guard Nick Young has agreed to a contract of unspecified length with the Los Angeles Lakers, according to his agent Mark Bartelstein. Young, whose flashy style of play on the court and ostentatious dress code off it earned him the nickname Swaggy P, spent last season with the 76ers. Mostly coming off the bench for them, Young averaged 10.6 points per game in 59 appearances. The shooting guard is familiar with L.A., having played his college ball at USC and having spent one season with the Los Angeles Clippers. Young was a head-scratcher of a player in his time with the Sixers. He seemed to be well-liked among those in the locker room and in the stands, but never could string together continuously solid play. He turned into a starter for Doug Collins’ team in January, after embracing defense. But he quickly fell out of favor with Collins … and fell out of the Sixers’ rotation. Young’s best games for the Sixers came when he had the freedom to fire away. His stats defend that theory: In wins, Young averaged 9.2 points on 41 percent shooting overall and 30 percent from 3-point range. In losses, he tallied 11.6 points on 41 percent shooting overall and 39 percent from long range. On five occasions last season, Young scored 21 or more points. The Sixers lost four of them. 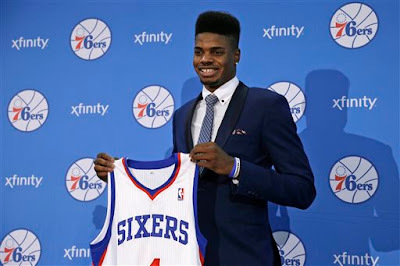 ****While the deal (technically) is unofficial – at least until Jrue Holiday returns from his honeymoon and signs paperwork to legitimize the trade – Nerlens Noel is a member of the 76ers … and he’s decided on a jersey number. According to an ESPN report, it’ll be No. 5 – as in the number of teams that passed on him in last month’s NBA Draft. One problem with that is Arnett Moultrie already wears No. 5, but that’s not an issue a gifted Rolex can’t fix. Looks like Andrew Bynum is hobbling to Cleveland. Only $6 million is guaranteed in the first season, with the other $6 million for his first season being linked to incentives. 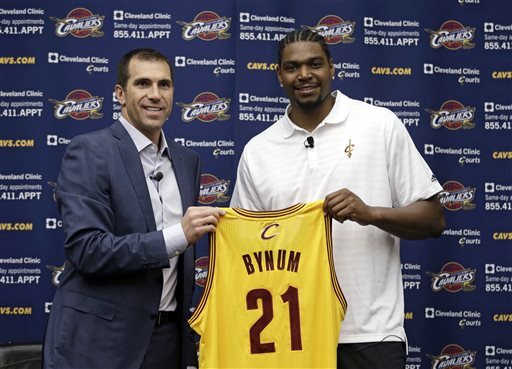 The second year on his contract is a team option, meaning the Cavaliers will decide whether Bynum returns for the 2014-15 season. Bynum, despite more than one attempt to debut for the Sixers, never played a game before deciding in March to undergo surgery on both knees. He made $16.8 million for the 2012-13 season. 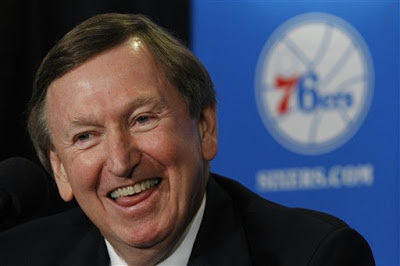 The 76ers’ brass lost a key figure Wednesday, when Rod Thorn was named the NBA’s president of basketball operations. Thorn, who had served as the Sixers’ president, was set to transition into a consultant’s role for the team moving forward. Instead, he had to sever ties with the team in order to accept the league gig. Thorn, who will be in charge of basketball and referee operations leaguewide, said the promotion was an opportunity he couldn’t turn down. “It’s a great opportunity for me and I’m very excited about it,” he said. 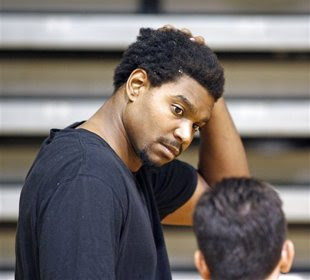 Andrew Bynum's unceremonious tenure in Philadelphia could be coming to a close soon. The free agent center received a $24 million, two-year contract offer from the Cleveland Cavaliers Tuesday, according to Yahoo! Sports. Bynum, per the Atlanta Journal-Constitution, is meeting with the Atlanta Hawks today, to see if he can get a deal from them, as well. Yahoo! is reporting that the deal from the Cavaliers has the second year of the deal as a team option (to protect against a suddenly healed Bynum walking at free agency a year from now) as well as incentives like minutes played, games played and training-camp participation. Bynum, acquired by the Sixers in a four-team megadeal last summer, never played a game in Philadelphia. He entered training camp with chronically injured knees and underwent season-ending surgery on both joints in March, after several bids to return to the court. When healthy, Bynum is one of few bigs who can play at his level. The 7-foot, 285-pounder had his best season as a pro in 2011-12 with the Los Angeles Lakers, averaging 18.7 points and 11.8 rebounds per game. 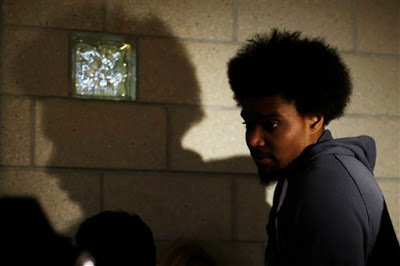 Bynum's agent, David Lee, said recently that his client would not work out for teams looking to give Bynum a contract. The Sixers have shown little to no interest in re-signing Bynum in free agency, despite new general manager Sam Hinkie's somewhat openness to doing so. At least that's how Hinkie made it sound in May, when he was introduced as the team's GM and president of basketball operations, though it wasn't exactly a ringing endorsement. Nearly 11 months ago to the day, Aug. 14, 2012, the Sixers introduced Bynum to fans in an open-to-the-public press conference at the National Constitution Center. There were high hopes that the Sixers, a team that fell one win shy of the 2012 Eastern Conference finals, would get over the hump behind Bynum. But the center never played, citing a host of knee injuries along the way. In September, Bynum flew to Germany for a non-invasive, plasma-enriching procedure called Orthokine. In October, he had injections of a joint lubrication called Synvisc-One. In November, while rehabbing his right knee, he admitted he injured his left knee while bowling. In December, Bynum was told to ramp up his rehab. In January, he engaged in a workout in front of reporters. In February, in addition to his primary physician, he visited an orthopaedic surgeon in New York. In March, he underwent two knee surgeries. That's an abbreviated timeline of Bynum's one-year, $16.8 million tenure with the Sixers. For the more-complete look, take a walk down memory lane on the blog. Getting younger and trimming their spending have been the prevailing trends of the 76ers’ offseason, and they continued that trend Friday night when they traded with Houston for second-year forward Royce White. In the move, which was first reported by Adrian Wojnarowski of Yahoo! Sports, the Sixers surrendered “future considerations”, which would probably end up being either a second-round draft pick or an overseas prospect. In other words, the Sixers did the Rockets a favor – and here’s why. White, a 6-8, 270-pounder who was the 16th overall pick in the 2012 draft, has yet to make his NBA debut. He did not play a single game for the Rockets last season. Instead, he suited up for their Development League team. At first, he refused the D-League assignment and picked up a suspension because of a “refusal to provide services” laid out in his contract. It’s also been reported that White battles anxiety issues and a persistent fear of flying. Due to make $1.71 million this season, White posted per-game averages of 11.4 points and 5.7 rebounds in 16 games with Rio Grande, the Rockets’ D-League affiliate. White joins a revamped Sixers roster that includes Kentucky’s Nerlens Noel, for whom they traded on draft day, as well as draft picks Michael Carter-Williams and Arsalan Kazemi. The Sixers launch their Orlando Summer League slate Sunday.